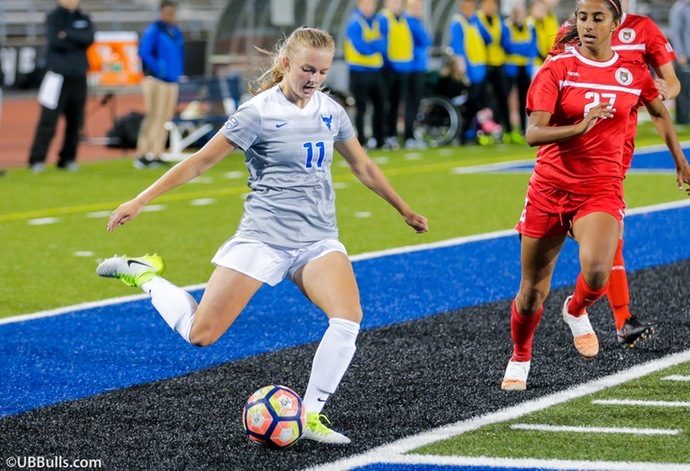 BUFFALO, N.Y. -- The University at Buffalo women's soccer team was picked to finish fourth in the preseason Mid-American Conference Soccer Poll, as announced by the conference office on Wednesday afternoon. The Bulls earned 111 points while also garnering one vote to win the MAC Tournament championship. The Kent State Golden Flashes were picked atop the poll as they earned 134 points and eight first place tallies while the Ball State Cardinals came in second with 119 points and one first place vote and the Bowling Green Falcons took third place with 114 points and two first place votes. Buffalo is coming off of their fourth straight trip to the MAC Tournament last season as they closed out the 2017 campaign with a 7-9-3 overall record and a 5-4-2 MAC mark. The Bulls saw their season come to a close in the MAC quarterfinals as Bowling Green handed UB the 3-1 defeat. 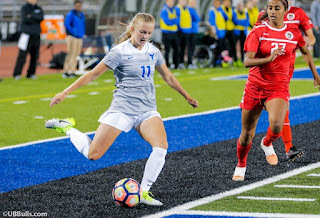 Entering this season, the Bulls return three of their top four scorers from a season ago as senior Carissima Cutrona will open her final collegiate campaign after leading UB with seven goals, four assists and 18 points in 2017. All-Freshman team performer Gianna Yurchak will look to build on a strong first season for the Bulls after she posted three goals and three assists while junior Kara Daly will be leaned on to produce at a high rate after she poured in a pair of goals and five helpers last season. Defensively, the Bulls will be returning possibly the best pair of defenders in the conference with First Team All-MAC performer Gurjeena Jandu holding down a center back position and Adrianna VanCuyck returning after a strong sophomore campaign. Seniors Rebecca Bramble and Meghan Simmons will also look to build on strong performances from a season ago as they each started at least 15 matches on defense for the Bulls. UB will open up their 2018 campaign on Monday, August 20 as they head to the Big Apple to take on the St. John's Red Storm at 7:00 pm.